I don’t like big cities. That’s probably funny to those of you know I grew up in the Los Angeles area and that my father loved to go to “Downtown.” Big cities bother me. And yet, conflicting and contradictory person that I am, I couldn’t live in a rural setting. It’s just not in my blood. So as a nice compromise, Albuquerque is small enough, yet large enough for my needs. Oh, I have complaints about ABQ too (see the conflicting and contradictory line above), but it often displays a very small town personality. I also love to travel. And that usually means big cities. I’ve been to Paris, New York, London, Los Angeles, Dallas, Chicago, Houston, Atlanta, Boston, Munich, Vienna, Budapest, Rome, Seattle, and others. I enjoyed visiting, but big cities still aren’t high on my list of places I’d like to live. I may have a mild case of agoraphobia–the fear of crowds part. Open spaces don’t bother me at all. Just crowds. That’s why I don’t do concerts well, or events of most sorts. This is why I find human nature so intriguing. I’m not afraid of many things others are–public speaking, spiders, snakes, elevators, bridges–but I could seriously do without crowds. And heights. Can’t do heights anymore. Except on bridges in a car, roller coasters, and airplanes. Yeah, see the conflicting and contradictory line above. When my children were small, in fact pre number three, some called to ask if we’d be willing to have a couple of graduate research students come to our house as part of a study on parenting. We said sure. Two lovely young ladies showed up with clipboards, and as they walked from room to room they just smiled. In each room their smiles grew bigger until they laughed. At that point we asked what was going on? They explained that their study was about books and the reading habits of parents and whether babies were exposed to books. Our house had books in every room. I don’t know what the data proved; we were never visited again. I think they just wanted statistics about how many homes had books in general. I know New Mexico is pretty bad about books in households. I was thinking about this visit just recently. With two of our daughters out of the house, we are trying to fix up the house. Bathrooms were done last year, but we need new carpet, new tile, new paint, etc. And I’m insisting on getting rid of the extraneous furniture that we’ve collected over the years. Which means however we have to get rid of books. It’s difficult to get rid of books. I know I’ve advocated not finishing books if you don’t like them, but books we’ve kept are here for a reason. Just this week I took our entire collection of hardcover Tom Clancy novels from the eighties (dating myself?) to Goodwill. My husband and I both read them (except Red Storm Rising–I couldn’t get into that one). But we’re still stuck with more books than we have room. There are books we will never re-read, but keep them for memory’s sake. When I glance at my shelves, I can remember exactly where I read them and the feelings they evoked. We once read a John Grisham book aloud to each other on a camping trip and long drive. We had so much fun. I’ve always wanted to do that again, but I am so over camping. The books have to go. They simply must. And it’s heartbreaking. But on the other hand, now someone else can bring them to life. Meanwhile Robot Guy and I have just finished reading/are reading The Merchant of Venice so we can better enjoy Christopher Moore’s A Serpent of Venice. Together. Yup. I’ve decided that reading the same books will be one of our hobbies now that the kids are essentially gone. That and bird watching. Wooden ice cream spoons—you know the ones wrapped in white paper that came with those ice cream cups? I love those things. A few years ago, someone was doing some sort of ice cream giveaway and I squirreled away about a dozen of those spoons to pull out when I needed special cheering. They’re gone now, but whenever I have a chance I eat ice cream with a wooden spoon. Those new fangled plastic ones that they put in gelato just aren’t as good. Miniatures—again, I don’t know why. I have enough dust catchers in my house. But anything miniature I love. Totally useless stuff. Maybe it’s a reaction to being tall and having gone through years of teasing for my height. Staring at waves or water flowing—I don’t know. Something about the constant change mesmerizes me, and I can get lost in the images. I can’t even say lost in thought, because I’m can’t really remember thinking while I do it. Maybe it’s just a form of meditation for me. On an opposite note staring into a fire (not a candle flame—too small) does the same thing. Finding random obscure grammar facts—My learning of language will never cease. Yeah, I’m one of those people. But I get a real thrill when I discover something (It could just be the sense of superiority I feel when I know something few others do—yeah, I’m that kind of person too) In grammar facts, please include the origins of idioms, punctuation, and all matter of language, including foreign and linguistic matters. Books I can get absolutely lost in—Okay, this one is cheating. I love this, not like this. Unfortunately it happens less and less these days. I can like a book, but not get so caught up in it that I’m living it. Those are the gems, the ones that make it hard to remember or care about reality. Mostly I just read books I enjoy. What about you? What odd little things help color in the nuances of your existence? You knew this one had to be about my dad. I’ve only ever heard this story second hand, but it shows the quiet (well, maybe not so quiet) strength my father had. 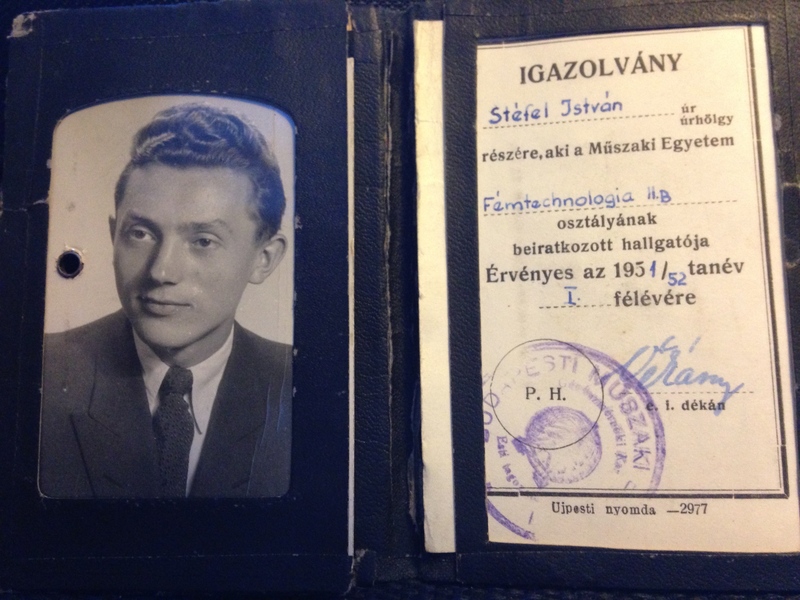 As a young adult in communist Hungary, he knew education was the only way to get anywhere. He was determined to be an engineer—not so much because he had a passion for it, but because he knew he could earn a good living and support a family as an engineer. Unfortunately, at that time all young men had to serve in the Hungarian army for two years starting as soon as they finished compulsory school. He really, really did NOT want to serve in the army. There were few exemptions, but it wasn’t like he was an ultra genius whom they would immediately excuse so that he could work on secret projects or something. Yet somehow he talked his way into getting a university exemption. He could attend school and not serve in the army. Someone neglected to tell the army that. He was told to report on such and such a day to register and enter basic training. Well, he showed up but started arguing that he wasn’t supposed to be there, he had an exemption, he was supposed to go to school, etc. They didn’t listen. So one the second day, he continued: It was a mistake, he was supposed to be in school, the army wasn’t supposed to have him. He complained for four solid days until they finally said okay, go, we don’t want you, just shut up. If you were a University student, you were supposed to serve summers. He didn’t do that either. This was his ID for his second year of school. I miss you, Apu. You left us much, much, much too early. I am a huge Harry Potter book fan. I liked the movies okay, but the books are what I return to over and over again. 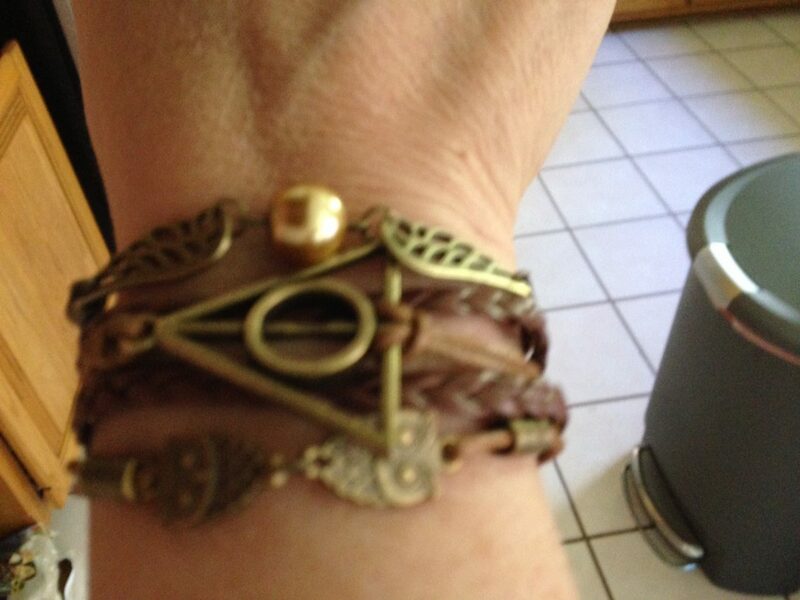 My new bracelet (that I wanted enough to overcome the frugal bone for) by Ashley Bridget. So a few years ago when I was traveling in Germany, I picked up the German copy of the first Harry Potter book. Why I didn’t buy more I’ll never know–probably because I didn’t have a lot of room for books with all the clothes I had to bring and all the souvenirs that came home with us on that trip–but only one book came home with me. I read it as soon as we reached home. And enjoyed it. (Although I have two gripes about two translations–one: while Schnurrbart can colloquially mean a cat’s whiskers, it threw me right out of the story to picture a cat with a mustache; two: Ein Junge überlebt does NOT have the same effect as The Boy Who Lived). So my goal became tracking down a complete set of Harry Potter in German. Okay, you’d think–go to Amazon and order. Well, I don’t want them as ebooks (I have no problems with ebooks, but some books I must have in tangible form), and since the first one I bought was paperback, I want them all in paperback. New, not used. The paperback versions cost between $40 and $50. I understand the cost of importing, etc, but really? For a brand new unsigned, not rare paperback? Because of my upbringing (immigrant parents who were the products of war, poverty, and communist takeover), I have a very strong frugal bone that I try hard to overcome. Often with little success. I have a really hard time spending money on frivolous things (On the plus side, I live with very little debt. House mortgage, that’s all). So the quest for Harry Potter in German became a real adventure. I thought acquiring the second book in the series would be easy-peasy. My mother and niece were traveling to Hungary. They had a four hour layover in Munich. Airports have bookstores. I asked my mother to go to the store and buy me book two in the series. I assured her that everyone in Germany speaks English (and that’s true for the most part. When I was there, no one let me speak German. They all spoke English to me. I was quite depressed about it. I know my accent has become terrible over the years, but I have no chance to practice here at home.) and Harry Potter was ubiquitous enough that any bookstore would understand Book 2 in the series. She couldn’t do it. For whatever reason, my mother couldn’t handle going to the bookstore and asking, and my niece was too shy to carry out the task herself. Now the story could have ended here. My mother simply could have said, “I didn’t get it.” I would have dealt with it. Not that big a deal. But no, my mother involved my cousins on my mother’s side who live in Karlsruhe. These cousins are two of the nicest people anywhere. They would give you the shirt off their backs if you needed it. I can’t ever repay their kindnesses toward me–how they entertained me in Budapest when I was a student abroad, how they hosted my entire family when we traveled to Europe a few years ago. They always go above and beyond. So when they heard I wanted this book in German, they pledged they would get it for me and send it to Hungary to my aunt’s house where my mother was staying, so my mother could pick it up there. Now,these cousins aren’t readers, and don’t understand the worldwide impression that HP created. When they went to the bookstore to get the book, the store didn’t have it. They had #1, and #3-7, but happened to be out of #2. So they left the store and called me to tell me that, see, your mother wouldn’t have been able to find the book even if she had tried, but they could have the book store order the book for me and they would still send it. I immediately said, no, this wasn’t that big a deal, but I believe I mentioned above that these cousins go above and beyond. They wouldn’t hear of me not having this book if I made a special request, so they ordered the book. Interestingly, the bookstore received it the next day because it was already on order (Yes, HP is that big a deal). So they picked up the book and sent it to their parent in Hungary. The guilt I was feeling by this time was enormous. I blame my mother (don’t we all?) for having told these cousins about my quest. Meanwhile my mother, who is getting up there in age, wasn’t feeling well on her trip. Her blood pressure was elevated, she was feeling stress from having to watch my niece, and so decided to travel home with my niece instead of staying for the two more weeks she had planned. (Don’t worry, Mom is fine now; the blood pressure thing has been taken care of; the good news is that with the levels she reached, if she didn’t blow an artery then, she never will). The book, of course, arrived after my mother left. So my book, which was supposed to be a time killing task at the Munich airport, was now sitting in my maternal aunt’s house in Hungary. Fast forward to this spring. My paternal aunt (also Hungarian) decides to travel back to Hungary for a visit. The two sides of the family know each other, if only because they have the emigrants in common. My maternal aunt is willing to get the book to my paternal aunt, if the paternal aunt is willing. Well, it was pretty smooth from there. The book was delivered, and HP#2 in German is sitting in my paternal aunt’s house…in California. My mother lives about 60 miles away from her, which means a good hour and a half drive or longer in SoCal, a drive not taken lightly at their advanced ages. My mother does not have the book yet. And I believe I mentioned that frugal bone I inherited above. Even when she does get it, she won’t mail it to me because we shall be visiting at some point, so she can wait until we get there. Save some money. I never thought collecting a series could be so complicated. I suppose if I tweak a few of the details, it might make a grand farce. Meanwhile book #3 was easy to acquire. A dear friend traveled to Germany with her husband on his business trip and brought it back for me. She doesn’t speak German either and was able to find it without difficulty. It’s now sitting on my table. I can’t read it though. Not until I read book #2 first. There are rules, you know. I’m just going to put it out there. I love spoilers. I like to know what’s going to happen before it happens. I can enjoy a book or movie if I already know the ending. It doesn’t bother me in the least. Sometimes the spoiler is the deciding factor if I’m going to watch a movie or read a book at all. If it doesn’t have that satisfying ending, forget it. I will especially forgo any book/film that has a “clever twist” ending (in quotes for a reason because I like twists). Those irritate the crap out of me, i.e. girl’s dad is dying, she promises to take care of him, she meets someone, dad gets mad and sicker, but it’s the boyfriend who dies tragically and suddenly, dad realizes how selfish he’s been, she needs to live her life, etc.- blech. (Hey, I’m allowed an opinion too. If you like those stories, fine. I applaud you for sticking up for yourself, but I don’t have to like them.). By the way, satisfying doesn’t mean happily ever after. Second Hand Lions starts with the death of the two uncles, but I love it. And Dandelion Wine (Ray Bradbury) has a higher body count than a lot of novels, but it’s wonderful and life affirming. A study at UCSD showed that knowing the spoiler/ending increases enjoyment of the work (the link is to an article about the study, not the study itself). I agree. Look, we all know romance novels make up the biggest segment of the fiction market. Every romance ends with the couple forming a relationship. Every single one (If it doesn’t, then it isn’t a romance). Guess what? That’s not what the readers read for. Romance readers love what they read. Could part of the reason be they know the ending? Yes, I read my books backwards. I always (ALWAYS) read the last few pages at the beginning. I think this enjoyment explains re-reading as well. I often told my students they need to read assignments twice- the first time just for the plot, the second for understanding. If you follow my blog you know I am currently re-reading George RR Martin’s Song of Fire and Ice series. It’s better the second time through. I know what happens; now I can concentrate on details and characterization. It’s so much richer this time. And I probably don’t have to tell you how many times I’ve read Harry Potter. In fact the saga of the German copy of Chamber of Secrets will be an upcoming blog. But each time there’s something new to enjoy and grasp. Italo Calvino said, “a classic is a book that has never finished saying what it has to say.” That sentence presumes reading things more than once. There are many books I won’t ever re-read or couldn’t get through the first time (and that’s okay too; I’ve blogged here on taste before). But the ones, books and movies, that I revisit several times are my classics. I find new meanings, nuances, and truths I didn’t on the previous viewings. And it’s easier to get to deeper understanding if you know the ending. Don’t worry. I try not to spoil endings for others. People can be touchy about the subject. But if I ask you for a spoiler, I really want it. I want to see the journey more than the end. Maybe you should try it a couple of times and see if you notice any difference in your reading. So how do you feel about spoilers? Just about the only thing I consider myself an expert in is language. By language, I mean grammar, words, and such. I speak a few languages, and have studied the “old” and “middle” versions of two of those languages. When my writer friends need help with a construct or want to make sure they are writing something correctly, they come to me. I love it not because I am “the expert,” but because I love looking up arcane grammar points, learning subtle grammar, and just expanding my knowledge base. Yes, I do language research just for fun. Now before you go correcting anything and everything I write here, I also know the difference between casual and formal language, and I don’t proofread everything I post here. I am not a typist. I still have to stare at the keyboard to find the right letters (I’m sure it’s just a crutch by now, but I still stare at the keyboard) and not at the page to make sure I’m putting it on paper right, which is why autocorrect annoys me so much. It gets me every time. I don’t want to have to analyze everything I write or write in perfect sentences because then I will just shut down, but errors do not mean I don’t know grammar (Spelling is a whole other can of beans; I have never claimed to know spelling, but I can tell you why some words are spelled the way they are). We all make errors, and honest errors exist. Deal with it. Fewer vs. less (and along those same lines amount vs. number)—If something has a specific number use fewer; if it’s abstract in number use less. If you can conceivably count it, use fewer. For example: 15 or fewer (items in this lane). Less money, fewer dollars. Fewer people, less humanity. The use of “than”—Not then vs. than, just than. If I say, “She is taller than me,” most people will understand that I am shorter than the female in question. But that’s not correct grammar. It should read, “She is taller than I.” You wouldn’t say, “She is taller than me am.” Case matters. The meaning changes between “She likes him better than me,” and “She likes him better than I.” In one I would be invited second. In the other, she can invite him first and I don’t care. Try to do (or insert whatever verb you want)—I see this all time as “try and do.” In fact I once had a copyeditor change “try to” to “try and.” No. “I will try to sleep” means I am making an attempt at resting and probably failing. “I will try and sleep” means I am attempting something unspecified and then I am falling unconscious for the night. Two separate actions. Who vs. whom—Call me old fashioned, but I love the distinction. (And we’re back to cases again.) There is a bumper I spy often extolling the joys of rescue animals. While I applaud the sentiment, the slogan “Who saved who?” drives me crazy. Who saved whom? Not that hard. You wouldn’t answer the question with He saved I or I saved he. Where you would use a “him” or a “her” in the sentence, use a “whom” in the question. Have vs. of—I will disown you if you write “I should of studied English harder.” One is a verb, the other a preposition. Nonexistent words—I’m lumping these together because there are far too many of them, but my biggest irritations arise from expresso, supposably, and excape. Apostrophes for plurals—Do not use an apostrophe to form a plural except in rare cases (Trust me, they are rare). Apostrophes are used to show possession or a missin’ letter (See what I did there?). Not even with numbers. And while I don’t get too hung up on the whole its-it’s, they’re-their-there, to-too-two (Remarkable really. I usually just shake my head when I see it, but it’s far too easy to type those in incorrectly and not see it on a re-read), loose vs. lose and choose vs. chose annoys me. Watch for wrong words in general. There’s a huge difference between a loose bowel and to lose a bowl. All rules can be bent, shaped, twisted, or broken to achieve a certain writing effect (not affect), but you do have to understand why you are breaking that rule to achieve the effect you wish. Words are important. What are some of your pet peeves in language? Have you ever reacted to something—a character, a sentence, an event—in a novel? I mean that gut feeling you get when you read something that produces a visceral reaction? Something that makes you cheer, or cry, or become angry or frustrated? I hope so. That’s part of the joys of reading for me. But have you ever wondered why you reacted as you have? More and more I’m convinced that when you have such a reaction it’s because you’ve hit “theme” in your book. I love talking about theme. I think it’s a vestigial trait from my teaching days. Theme, very simply, is what the author is saying about a universal truth (as long as truth is relative—some people believe eating animals is a sin and others enjoy hamburgers). The author comes to his or her novel with his or her own life views and often can’t help but express what they believe in their writing. For example, I often write about the honor in doing the right thing. That doing the right thing, no matter how unpleasant or what the cost, is a noble goal. In my stories I’ve had characters become outlaws because they believe in doing the right thing. Society is wrong, and they can’t go along with society because it would diminish them as human beings. The loss of honor is a greater tragedy than following the rules. So next time you react to something you’ve seen or read, think about it a moment. What created such a strong reaction from you? And I’m not just talking positive emotions. Want an exercise in frustration and anger? Watch or read Game of Thrones. What an experience.